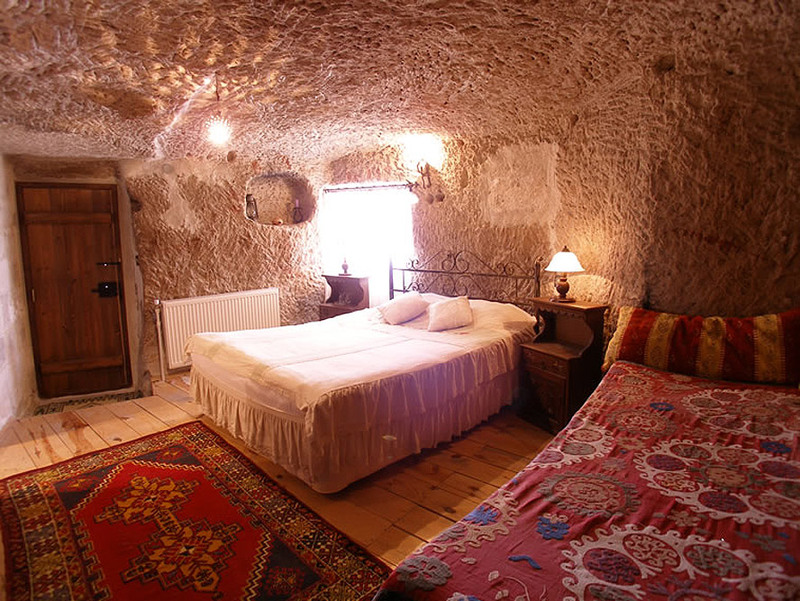 One of the things that draws thousands of visitors every year to Cappadocia in central Turkey is the prospect of staying a “cave hotel.” These wind-carved structures have been hollowed out and lived in for centuries, and with the uptick in tourism, many are being converted into hotels. 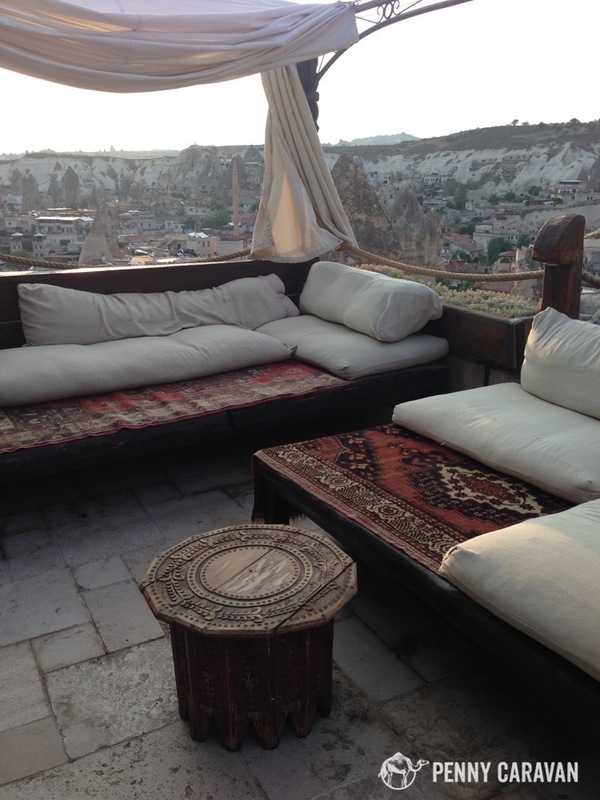 On our second trip to Cappadocia we stayed at Kelebek Hotel in Göreme, which features 47 rooms tucked away on a beautiful property loaded with amenities. Kelebek Hotel | From $55 with shared bathroom; from $75 with ensuite. 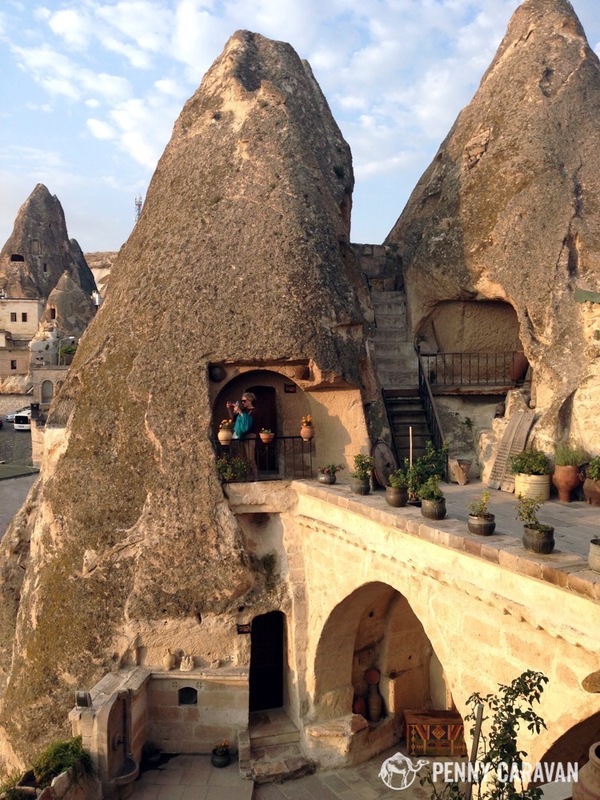 Location: Göreme is a small town, so everything is fairly accessible on foot. 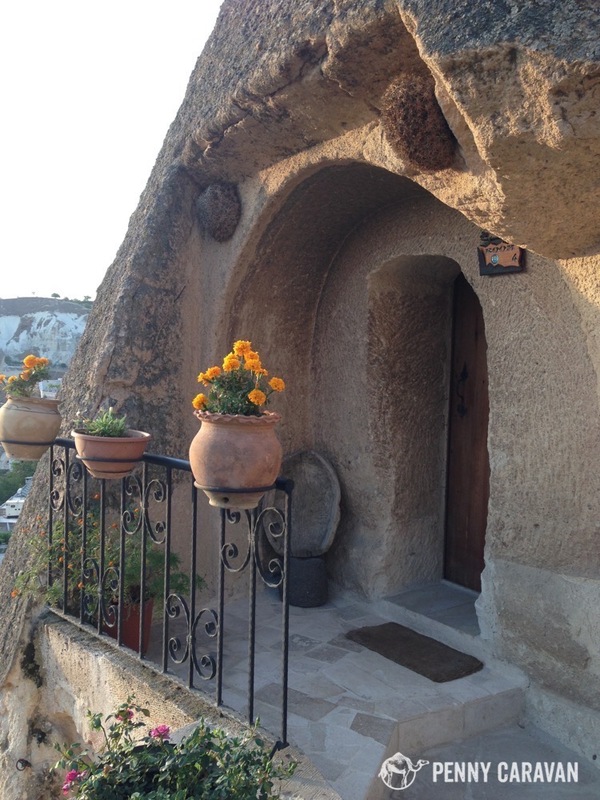 However, Kelebek is located in the Southwest corner of Göreme up a very steep hill. While the location was just fine for us, it was quite a hike for Iylana’s parents and we ended up taking taxis to and from the hotel to the city center, which was $5TL each way (about $1.50 USD). It’s a short 5 minute walk downhill to get to the main road. Hotel Grounds: Kelebek has many common area lounges that are perfect for hanging out with your group, including hammocks by the pool! 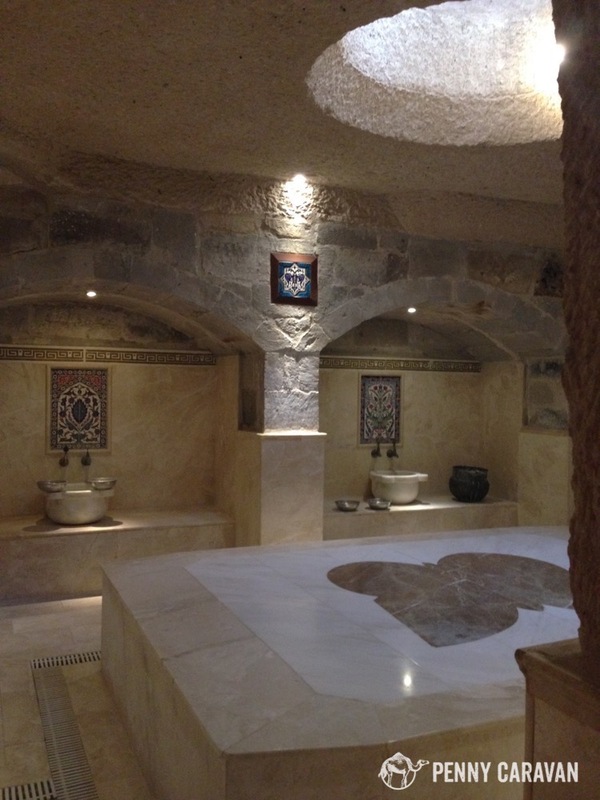 They also have a Hamam (Turkish Bath) here at the hotel. 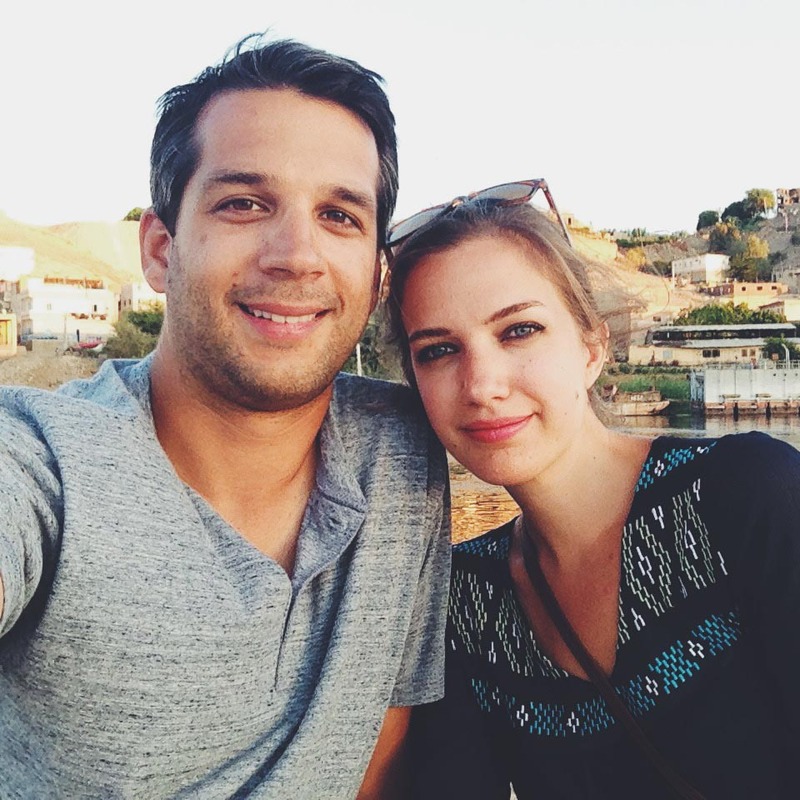 We enjoyed a couples bath and massage, which was the perfect end to a long day of hiking. The hotel has a couple of terraces that are great for watching the balloons take off every morning. Free wifi worked best in the common areas, but not so good in our room which was a little further from the main building. Laundry services were also available. 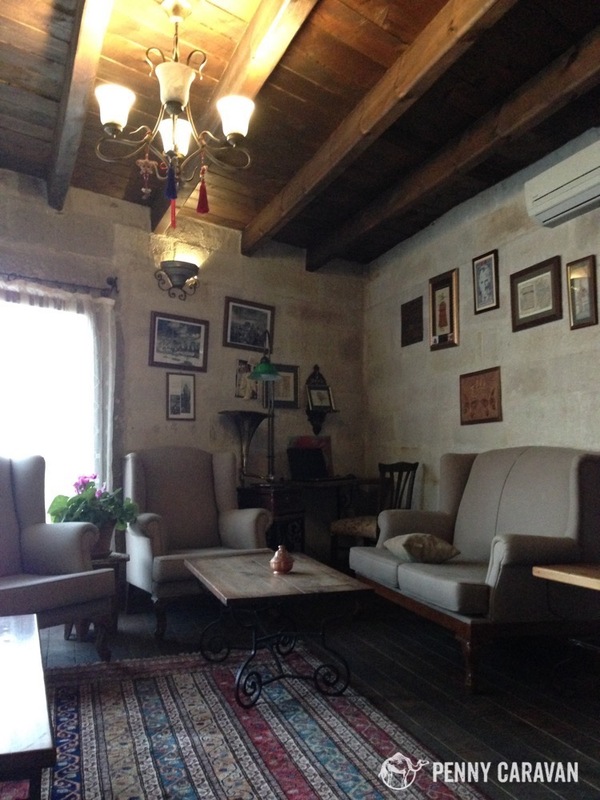 Rooms: Kelebek has 47 rooms in varying sizes. 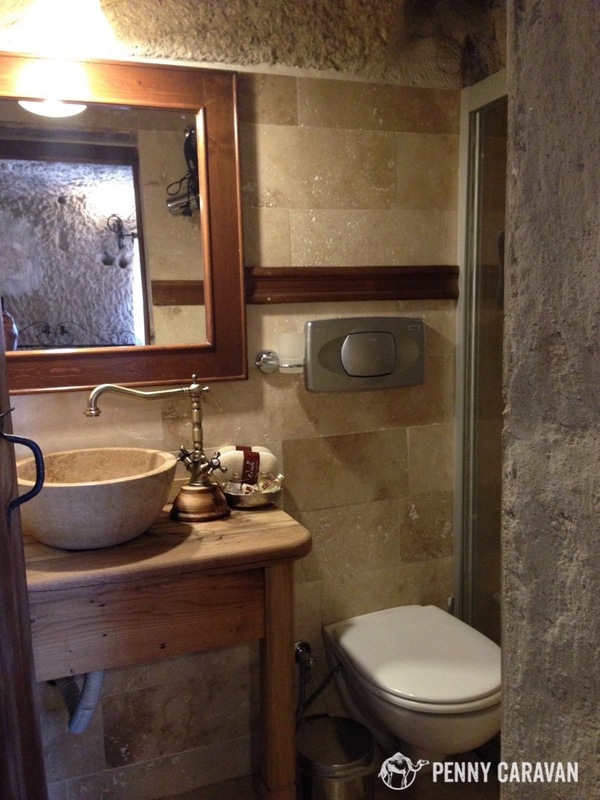 We chose to stay in the fairy chimney room which had a private bathroom. The temperature was a little hot as there is no air conditioning, but they did provide a fan for us. 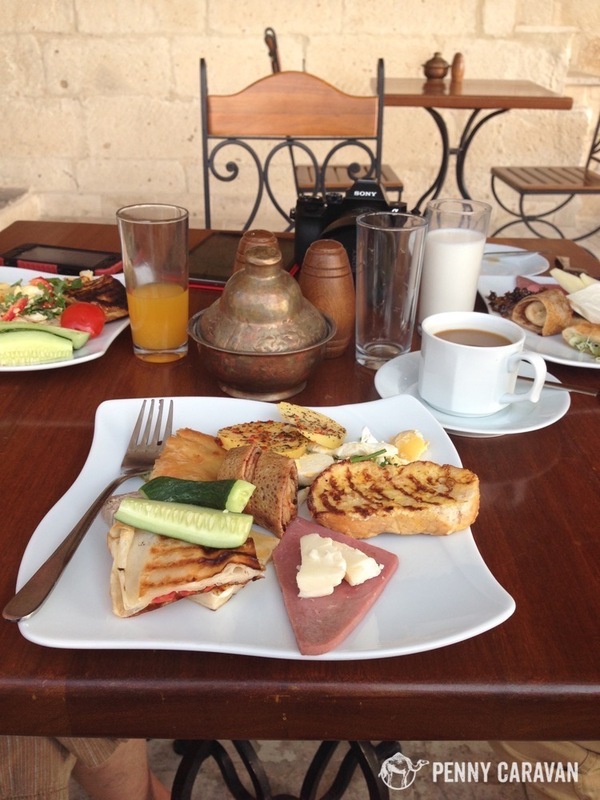 There is a mosque nearby, so be prepared to wake up to the muezzin. 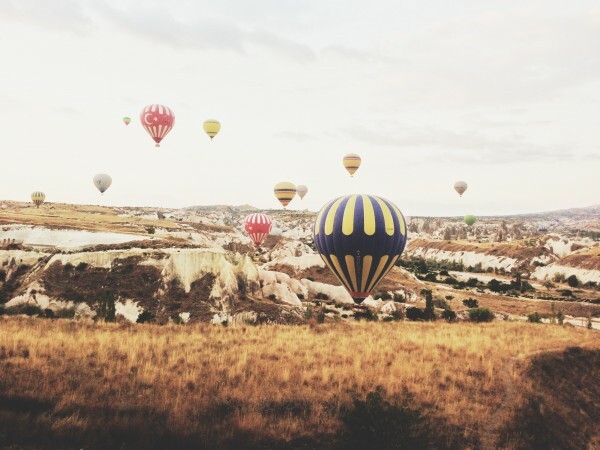 There is no sleeping in here—with the balloons taking off every morning, you’ll want to get up early to watch the sun rise, then take a nap in the heat of the day! Staff: As soon as we arrived, the staff helped us arrange all of our activities including balloon rides, the Green tour, and dinner reservations at Nostalji. 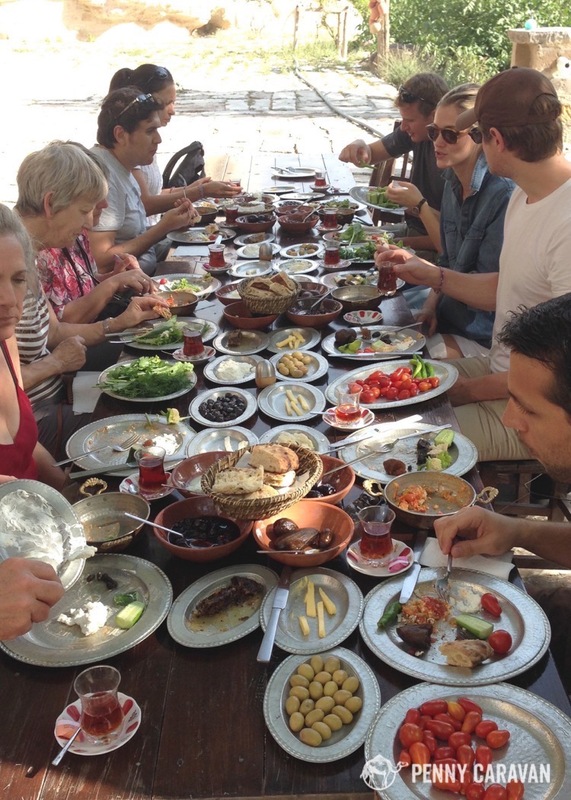 Additionally, Kelebek offers an organic farm breakfast tour, which is available to anyone but free for hotel guests. You’ll just need to make a reservation with reception as space is limited. This was definitely one of the highlights of our visit! We all piled into a tractor trailer, and our host explained to us a little about the agriculture of the area during our short drive. 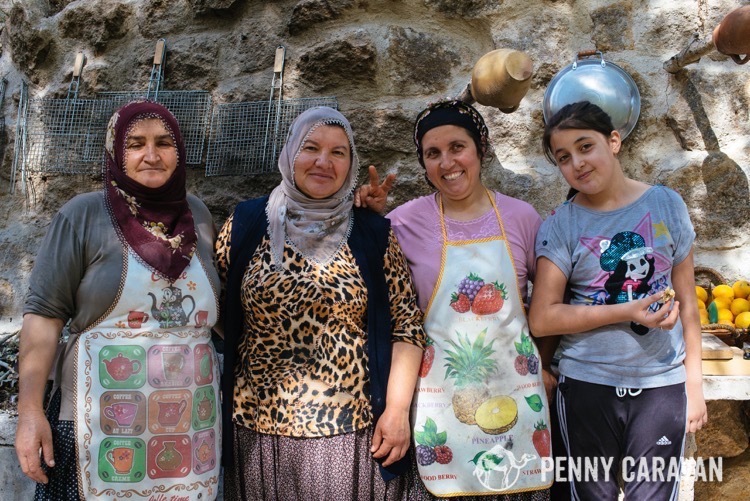 Then we walked to the bottom of the valley where a feast was waiting for us, prepared by the sweetest ladies who showed us how to make their unique bread. 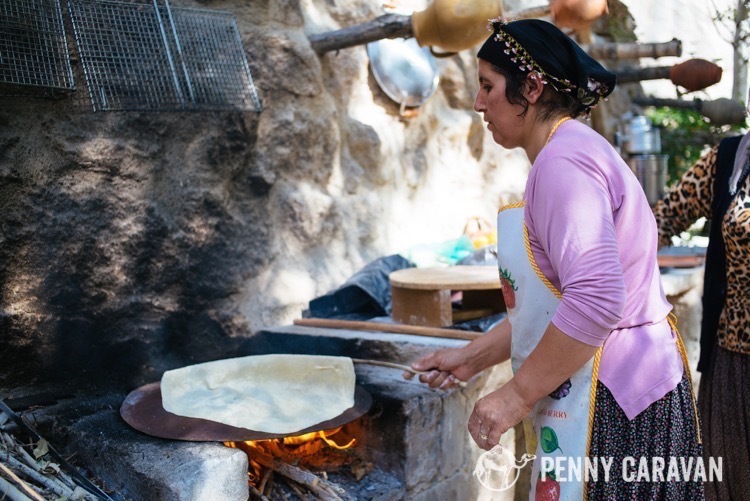 And if you enjoy it enough, they now offer a Turkish cooking class so you can learn to make these yummy treats yourself. This is a new addition since we visited. We’re going to have to go back and put this on our agenda now! In conclusion: Kelebek is a popular hotel choice and offers it’s guests a wide array of amenities that help make your stays more relaxing. 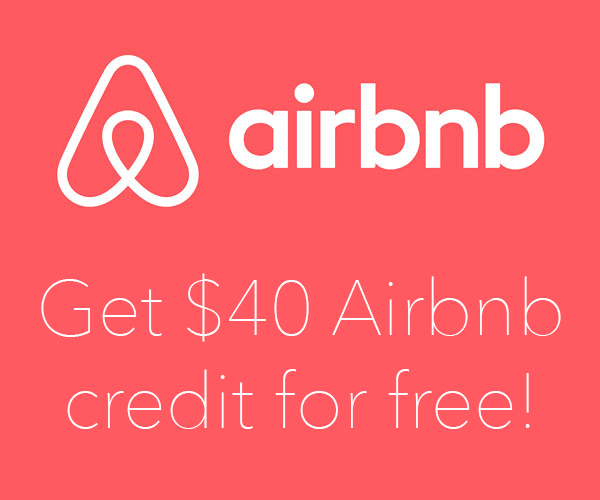 With 47 rooms there are options to suit just about any budget. 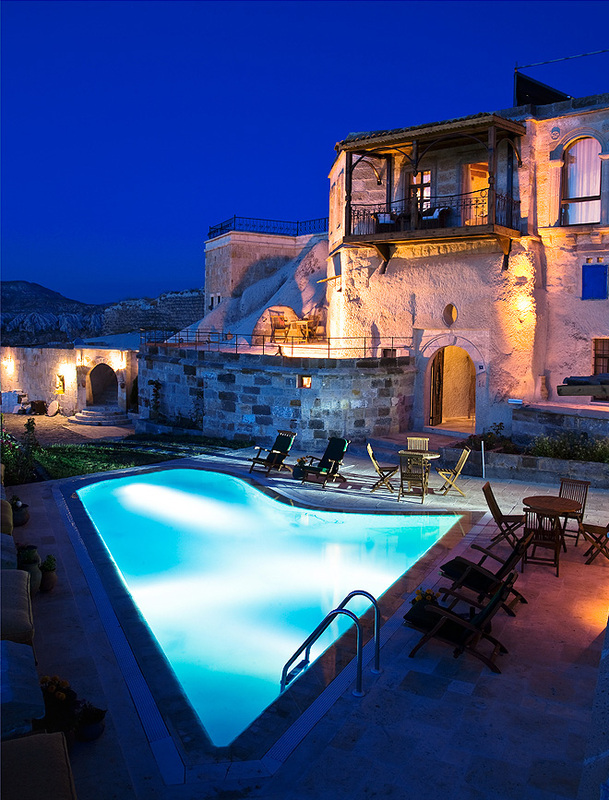 The onside pool and hamam offer guests relaxation after a long day’s hike in the valleys of Cappadocia. The free organic farm breakfast truly sets this hotel apart. 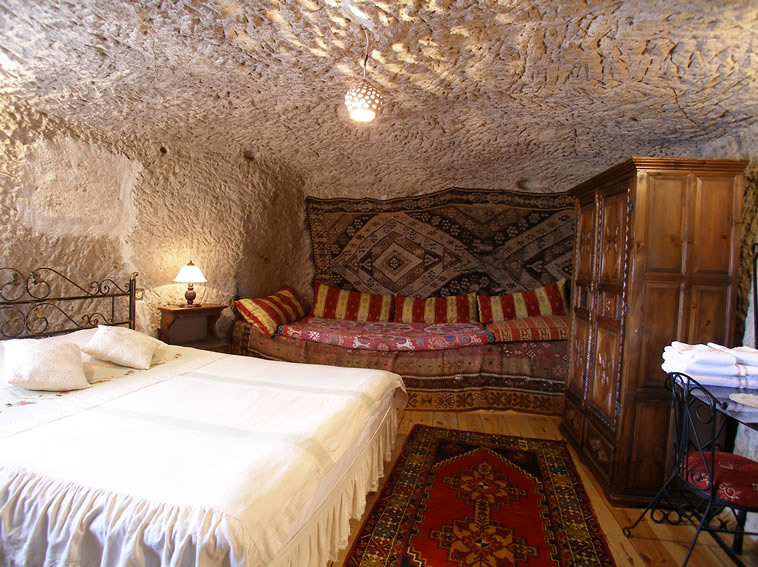 Kelebek offers guests more than just a place to lay their head; with all the amenities, a stay at Kelebek really shines as a highlight of your Cappadocia trip. Thank you Natalie! We can’t wait to visit Goreme again as there is so much more to see. I agree, a cave home would be lovely! Their staff are so sweet! Glad you had a good time!